We had previously banked our daughter's cord blood with the Cord Blood Registry and so we receive their newsletters via email. Normally I just delete them, but for some reason I read the one that came out about two months before Owen was born (Owen's Guardian Angel found him early it seems). It said that some promising research is being done in using cord blood stem cells to treat pediatric brain damage. Through the wonders of Google and the internet I was able to trace this research back to a Dr. Joanne Kurtzberg at Duke University Medical Center. I got in touch with Dr. Kurtzberg and she said that while the treatment had never been tried specifically for hydrocephalus, there was sufficient enough promise in the treatment to make it worth the attempt. You can go here for one of the case studies, and click here for a story on CNN about Dr. Kurtzberg's research. In March 2008 NBC covered this research on the Today Show and on the Nightly News. You can see the Today Show segment here. The blood contained in the umbilical cord of a baby contains stem cells. These types of cells are special because they can become other types of cells and so are used as "building blocks" in the body. Once the umbilical cord is cut the supply of stem cells to the body is also stopped. The existing stem cells in the blood supply are either used or die off within a fairly short time. If you collected and preserved the cells at the time of the birth however, then you have some of these cells that can be reintroduced at a later time so that they can go in and do some repair work. They can't cure the hydrocephalus and create a path for CSF drainage where none exists, but they may be able to help replace the cells that were damaged due to the pressure in the womb. We knew that there were no guarantees, and that there would be no way to ever know if the stem cells had actually helped. We also knew that there was almost no risk in the procedure because they were using his own cells. We decided that if there was even the smallest possibility that this procedure would help, we were going to do it. 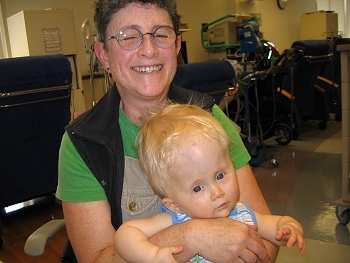 Owen's physical therapist swears that she has never seen a child with such severe hydrocephalus that does not have muscle tone problems, and yet Owen has none. Is this because of the stem cells? There is no way to know because there was a theoretical chance that this outcome could have happened without them. It wasn't likely, but it was possible and so there is no way to say absolutely. But in our minds, it doesn't matter. We did everything we could, gave him every possible chance - including this treatment, and that's all you can do as a parent. I would also like to put in a note about genetic conditions such as x-linked aqueductal stenosis, or the Trisomy conditions (Down Syndrome, Edward's Syndrome, Patau Syndrome, etc). These conditions cannot be helped by a cord blood infusion, because the DNA of the cord blood will contain the same error as the rest of the child's DNA. 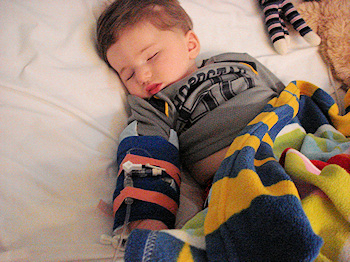 For certain conditions, there are specific reasons not to do a cord blood infusion. Down Syndrome (Trisomy 21) carries an increased risk of leukemia and infusing more cells which might carry the leukemia could worsen their condition. Some of the other genetic conditions often carry with them such severe problems, which cannot be helped by cord blood, that an infusion is not likely to make a real difference in the prognosis. It is NOT possible to use cord blood from a donor for this procedure, not even from siblings or even twins. The reason for this is that in order to use anyone else's cord blood the child would have to go through extensive chemotherapy to completely suppress their immune system to prevent rejection. If the child has a disease that will almost assuredly end in death such as cancer then it is worth the risk to find the closest match possible and then suppress the immune system. If death is not the only possible outcome without the treatment then it is not worth the risk of using someone else's cells. I also cannot give you the details on cost here because every insurance company has their own contracts with Duke and their own negotiated prices. Many insurances do cover this procedure, ours did, but then again many do not. Each person will have to contact Duke directly to find out if a deal can be made with their insurance company. Even if you don't have insurance they will help you with often extremely extended payment plans and such to make it possible. If you are interested in doing this then you will need to contact Dr. Kurtzberg's office at (919) 668-1119. She is the only one in the world that is offering this procedure for hydrocephalus that we know of. If you live close enough to Duke (Durham, NC) to deliver there, that is the best method. The cord blood is collected at the time of delivery and stored there until after the shunting is done. Within a few days of the shunting, the stem cells from the cord blood are infused back into your baby. If the birth and shunting were done at Duke they can use the IV's that were put in place for the surgery and they won't have to insert them again just for this procedure. If you do not live close enough then you can get a kit, similar to those provided by the commercial cord blood banking companies. Since those kits are so common now, most OB's don't have a problem with the collection procedure. The cord blood is then couriered to Duke and put into storage. When your baby is strong enough you would then fly or drive to Duke for the infusion. If your child has already been born and you banked the cells with a commercial service such as the Cord Blood Registry or Viacord then Duke can work with them to transport the cells and use them at Duke. 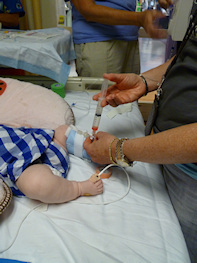 Owen had his infusion on October 3, 2006, 5 days after his shunting. 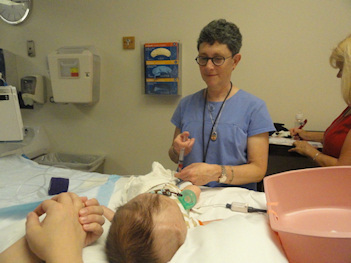 Owen's infusion was the first done specifically for hydrocephalus, but it was not the last. Since then there have been several other babies that have had it done. 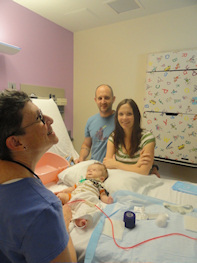 Dr. Kurtzberg is the woman sitting with Owen on the right, taken when we went down for Jameson's infusion. She has been the most wonderful person to have in Owen's life. We visit every time we go back to Duke for our checkups and she has had many great suggestions about care for Owen. She is a person who cares deeply about the children that she works with. Jameson came all the way from Idaho to get his infusion on September 4, 2007. 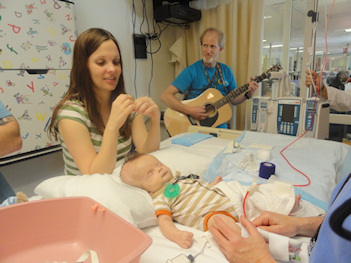 He was just two months old when his family made the trip to Duke for the procedure. Owen and I drove down to Duke to meet them and see their infusion. Owen tried to eat Jameson's shirt and they made fast friends. They are a wonderful family and it was great to meet them. Elisabeth came all the way from Washington state for her infusion on November 6, 2007. We tried to get a picture when both of the babies were completely awake, but the best we could manage was to get one when they were only half awake, or maybe more than halfway asleep in Owen's case. Elisabeth's infusion was scheduled for the same day as Owen's checkup so we were lucky enough to be able to meet her wonderful family. You can read Elisabeth's family blog here. 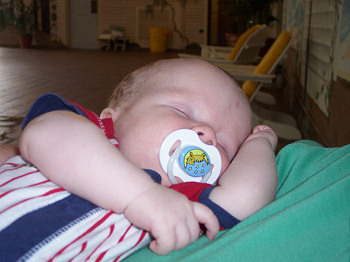 Elijah was born on December 20, 2007 at Duke and had his infusion a few days later on December 26, 2007. Elijah and his family live very close to us, right on our way home from our daughter's school and I have enjoyed getting to know them. After he came home and got settled in, we stopped in for a visit. The two boys were just too cute together! You can read Elijah's family blog here. 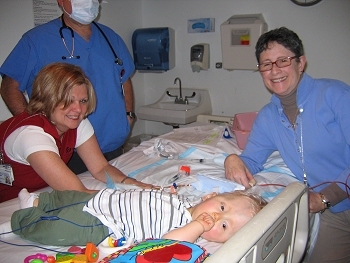 On February 19, 2008 Owen had his second infusion. When he was born they were able to obtain three separate "batches" of cells. The first was given soon after he was born. The other two batches were saved just in case he showed signs of delays later on. At 16 months old he is physically doing quite well but he still does not wave, do any mimicking, and has not shown any ability to use even the most basic signs. It's an odd thing because he is quite adept at manipulating toys and handles self feeding very well given the head size issues. He is very social and loves to laugh, but there is definitely a gap there in the intellectual development. These delays were worrisome enough to make us think that it was worth a try with the second batch. As with the first try, there are no guarantees and we may not ever know if it helped. The cells may even at this moment be fixing some emotional problem we didn't know he had, or giving him the ability to do calculus later on. If he does suddenly start signing or waving or anything else that he is clearly behind on in the very near future though, it will certainly be a more clear change than anything we could have seen right after his birth. **Update Note: Please see Our Story for an update about Owen's progress since his second infusion. I said that if he started to sign it would be a wonder. On that page you can see a video of Owen making his first sign. Kendal was born on February 5, 2008 at Duke. She had her infusion on March 20, 2008 about a month and a half later. Unfortunately they forgot their camera that day, but we have some beautiful pictures of her on other days to share. Cayman was born on March 8, 2008 in Ann Arbor, Michigan. 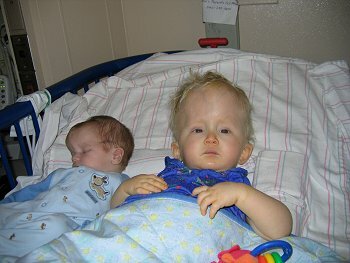 Their home is in Ohio and they drove all the way from there for little Cayman's infusion on April 15, 2008. You can read Cayman's family blog here. 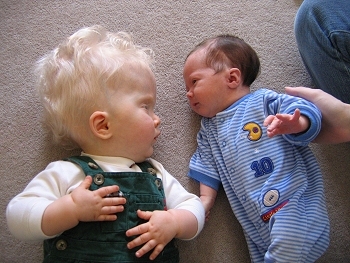 Mark and his twin brother Patrick were born on April 23, 2008. 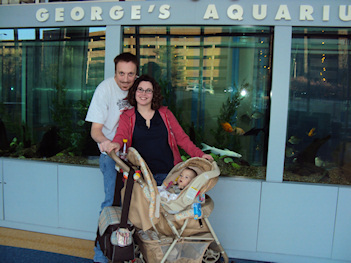 Their family came down from Kensington, Maryland for Mark's cord blood infusion on June 3, 2008. Matthew Owen was born on May 20, 2008. They flew from their home in Lincoln, Nebraska for their son's infusion on June 19, 2008. We were lucky enough to meet this wonderful family while Owen was in the hospital for a shunt infection and we got a picture of the two boys in Owen's crib. You can read Matthew's family blog here. Parker was born on August 26, 2008. 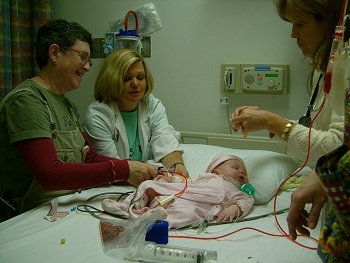 Her family came from Oklahoma for her cord blood infusion on September 29, 2008. 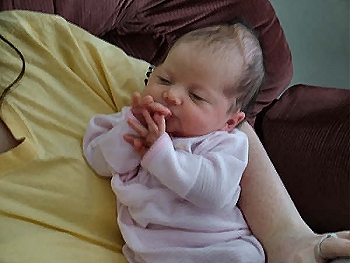 Bryleigh Marie was born on January 5, 2009. 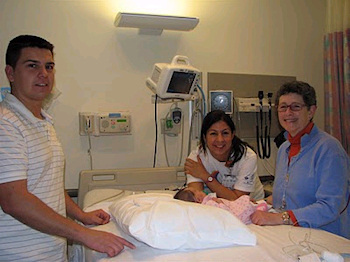 She and her family flew from Dallas, Texas for her infusion on February 17, 2009. 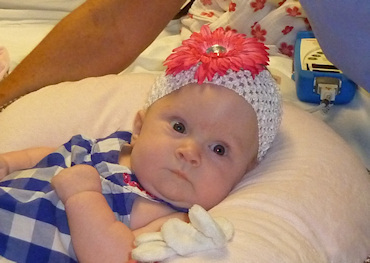 You can read Bryleigh's family blog here. 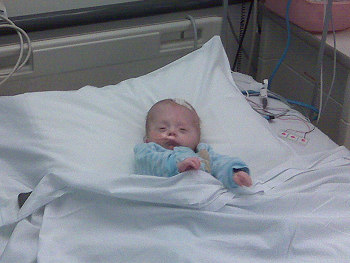 Joey was born on April 23, 2009 at University of Kentucky Hospital in Lexington, Kentucky. His infusion was done on June 9, 2009. Joey's Mom says that she would recommend for anyone who is able to do this procedure because if her son has any developmental issues or delays she knows that she did everything possible to help him. You can read Joey's blog here. In the entries above you will see the first infusions for Kendal and Parker. 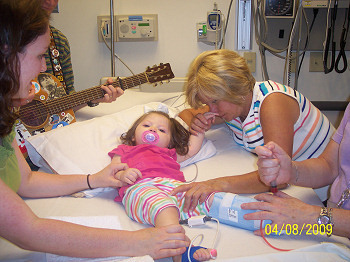 On August 4, 2009 both girls came back for their second infusions and as an added bonus they got to meet each other! Jared was born on September 10, 2009. He and his family came down from Pennsylvania for his infusion on October 27, 2009. You can read Jared's blog here. Lexie was born on December 23, 2009. 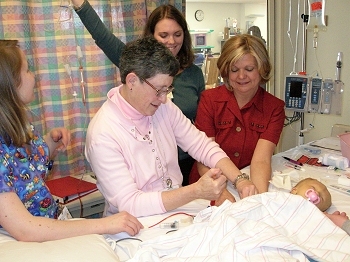 Her family came all the way from Texas for her infusion on January 18, 2010. You can read about Lexie and her family here. Maddox was born on July 14, 2009. 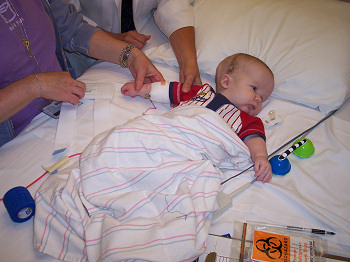 The picture on the left is from his first cord blood infusion in February 2010, and the one of the right is from his second infusion on July 27, 2010. His family traveled from Texas. 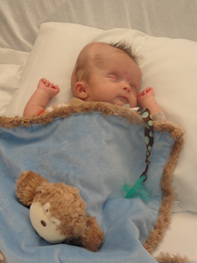 You can read Maddox's story here. 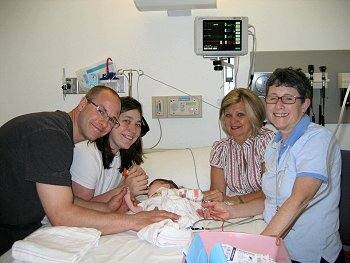 Madeline was born on March 12, 2010 and came in for her infusion on May 18, 2010. Claire's family traveled all the way from Georgia to have Claire at Duke on January 5, 2011. She had her cord blood infusion on January 18th. You can read all about Claire here. 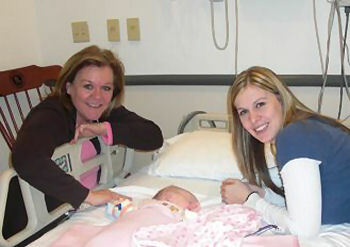 Marlena was born on December 7, 2010 and came from South Carolina in for her infusion on January 25, 2010. You can read Marlena's story here. 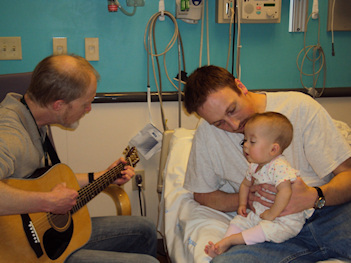 Tessa Hope and her family came from Idaho to have her infusion in February of 2011. You can read Tessa's story here. 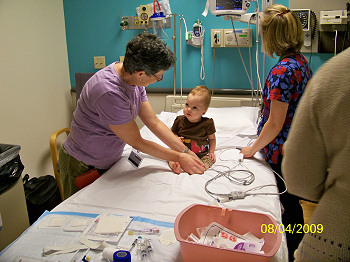 Eli and his family came from St. Louis, Missouri to have his infusion on May 24, 2011. 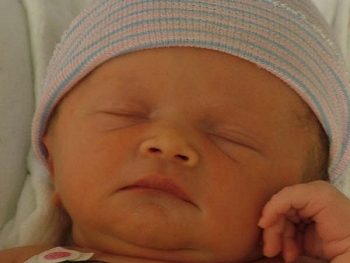 Addie was born on May 20, 2011. 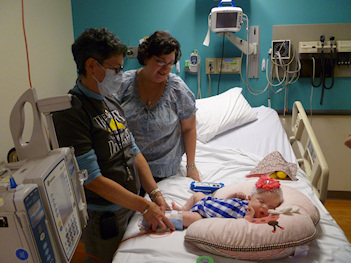 She and her family flew all the way from Austin, Texas on August 16, 2011 for her infusion. You can read more about Addie here: here. Legal Disclaimer: While every effort has been made to make certain that the information contained in this website is accurate, it must be remembered that the content is managed by a parent, not by a doctor. Information contained here is for general support purposes only and is no substitute for the care of a physician.